Raw food bread that melts in your mouth: The raw food recipe for linseed “sourdough” bread, made with the Personal Blender. If you are looking for bread that contains no yeast, gluten or oil, the raw bread recipe created by Victoria Boutenko is just what you are after. You have to allow the dough to prove for 1-3 days. 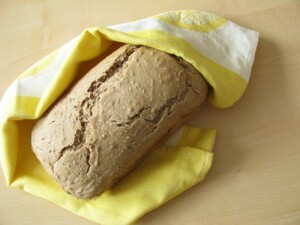 A shorter drying time results in raw food bread that is still slightly moist, while a longer drying time will produce crackers. To be able to make linseed “sourdough” you will need a dehydrator. First mix all the wet ingredients in a number of separate stages. After that, mix the pre-mixed wet ingredients together with the solid ingredients in a large bowl, cover the bowl with a tea towel and leave the dough to prove for 1-3 days. Shape it into long, thin loaves and place them on a Paraflexx drying sheet. The raw food loaves of bread need to dry in a dehydrator for 12-18 hours at approx. 40°C, after which they need to be turned over and dried for a further 6-12 hours.